Snow-capped mountains and majestic tuskers. The simplicity and beauty of an honest safari camp. The romance and glamour of yore. Gas lanterns hissing in the dark while clouds scud across an expansive, star-studded sky. A hyena calls. A lion responds. And a stately giraffe stands sentry at dusk. Golden embers, warm soups, convivial stories. Kenya has enmeshed us again. With Kilimanjaro as your backdrop and impressive herds of elephants silhouetted against the horizon, Amboseli is the perfect start to this fly-in safari that you can enjoy with your family & friends for a comprehensive overview of Kenya at its best. From mountains to plains to swamplands, it takes you to three stunning areas of Kenya, selected by us especially to give you access to a wide range of habitats, wildlife and some amazing adventure activities for kids and grown-ups alike. After spending one night at the comfortable Emakoko hotel enjoying the only national park attached to any capital city, you will fly south to Amboseli National Park and Tortilis Camp for the first leg of your safari. 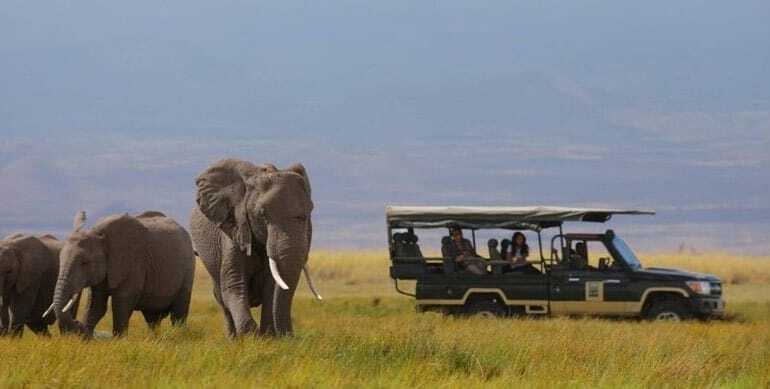 Then you will move on to Lewa Safari Camp and to one of the most successful private efforts to save endangered species anywhere on the continent. This part of Kenya is a favorite of the British royals. The safari will end with adrenaline-filled moments at Cottar’s Camp in the Masai Mara, famous for its extraordinary array of big cats and other resident wildlife. Cottar’s Camp returns you to the original spirit and essence of romance, professional guiding, adventure and elegance. Situated in the Masai Mara, in an untouched exclusive concession bordering the Serengeti and Loliondo reserves, the area guarantees privacy and an abundance of wildlife. This extraordinary safari begins and ends in Nairobi.